Agents of S.H.I.E.L.D. : Season 3, Episode 20 - "Emancipation"
Beneath all the action, "Emancipation" ponders deeper questions of faith and freedom. Subtitle: Season 3, Episode 20 - "Emancipation"
There was hardly a mention of S.H.I.E.L.D. in Captain America: Civil War, although the comic book version of the story was all about S.H.I.E.L.D. as the implementers of the registration act. 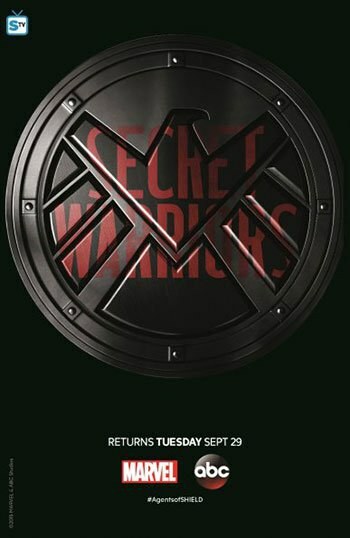 The movie, did, however, impact Marvel's Agents of S.H.I.E.L.D. right from the opening scene, as Coulson (Clark Gregg) and General Talbot (Adrian Pasdar) faced off in a bar in the middle of nowhere. Coulson refuses to register his Inhumans, citing that not all of the Avengers signed. That need to register has become one of the centerpieces of Agents of S.H.I.E.L.D., at least for this episode, but with Hive (Brett Dalton) still in the mix, registration seems a moot point. Hive is literally infecting Inhumans to build up his alien kumbaya club, and he and his minions don’t recognize any earthly authority. In fact, with the nearness in apparent time between Agents of S.H.I.E.L.D.’s "Emancipation" and Captain America: Civil War, one wonders why there even was a civil war. You have Phil Coulson, the guy who brought the Avengers together in the first place when he died at the staff of Loki, and Hive, a bigger bad than Loki or Ultron roaming the Great Plains drafting Inhumans. That would usually constitute an existential threat bigger than father-turned-terrorist out to get the Avengers (the plot of Captain America: Civil War). The edges of the Marvel Cinematic Universe (MCU) aren't exactly synching up. That, of course, is when you have to just sit back and recognize that these are entertainments, and the grand schemes of writers and directors aren't so grand. We have to take them as they are, in their moment. Even the Hebrew Bible has two versions of the creation of man. Stories need not be overtly rationalized to make their points -- their narratives needs not be coherent or consistent to entertain -- they just need to be compelling enough for the moment. The devaluing of human life, for instance, makes a point, as Radcliffe’s (John Hannah) half-assed Kree gene therapy results in primitive iIhumans no longer possessing their personal human narrative or any hint of individualism. The primitives are connected to Hive upon transformation. They can't speak, but they're strong and do the bidding of their cult leader. Rather than let Radcliffe perfect the formula, Hive says that these less-than-human Inhumans will do. He’s no longer concerned with the freeing of humanity to unleash its hidden potential, but in creating a race of subordinate unthinkers that he can lord over. There's a sadness in all of this. Radcliffe sees it. As twisted as his vision of the future may be, that vision is one focused very much on individual humans achieving their most radical desires and dreams. He doesn’t experiment for his own gain, nor for any greater power, he experiments simply because of interest in challenging the assumptions of humanity. His subjects are all willing; they seek him out. He remains alive because he can find ways to continue to be of value, and though a sycophant, and clearly not a man of personal moral bravery, in many ways he's as much a victim as those he transforms. Rather than his genes being manipulated, his light leash on morals becomes the string pulled by Hive to twist around whatever remnants of self-respect remain. Daisy (Chloe Bennet) finds this sad, as does Hellfire (Axel Whitehead). The great cult of deliverance from the limitations of the human condition, the end of war, and the bringing together of Inhumanity, deteriorates in the hands of their now-impatient god. Worse, the connection to Hive forces them to actually enjoy the indignity. Ultimately, such a world needs saviors, and it finds one in the combination of Lash (Matthew Willig) and Daisy. Sent by S.H.I.E.L.D. as the countermeasure to Hive, Lash, the destroyer of unworthy Inhumans, battles Hive to a standoff, but not before he returns Daisy to her humanity. Nearly drained of blood in sacrifice to the cause of creating the primitive Inhumans (her blood being the major component of the cocktail), Lash reaches inside of her and pulls the controlling parasites from her body and destroys them. But saviors must be sacrificed as well. Lash, as the religious zealot of Inhuman purity, ends in a lash of Hellfire at the end of a chain piercing his chest. May’s (Ming-Na Wen) Doctor Garner (Blair Underwood) is no more. The Inhumans no longer have any champion capable of fighting Hive at his level. Daisy does escape, returning home in the Quinjet -- returning home broken and guilty, but with the body of Lash as a symbol of his sacrifice. Lash won't become the object of cult following, or the subject of admiration. While there are intended religious parallels, Lash, in Agents of S.H.I.E.L.D., had no followers. Religion in the MCU remains a human striving, not an Inhuman one. The cults of difference that rise up, be they the paradise of Daisy's mother, or the twisted, chemically induced community created by Hive, are not ultimately cults of any deep and meaningful message that transcends their creators. While S.H.I.E.L.D. may be the ultimate secular organization, it derives from a religious and moral history, from a world that has its definitions of right and wrong. Like all things human, those definitions are subject to personal history and perspective; they are malleable and individual. That ambiguity is what leads to civil war, to the deep divides that shatter agreements on common goals. Right and wrong are subtle; the edges are blurry, and the same event can be understood as both. Big bads and evil incarnate aside, no one's innocent, and no one's purely evil. History defines us, and all of the moral ambiguity we face is but history unfolding too fast to process, too rapidly to do anything but choose what seems right at the moment, too rapidly to be certain of anything. Good and evil, right and wrong, may be absolutes, but they can only be really judged by the long lens of the future looking backward. Even then, agreement on the attributes of the absolutes remains contested. That an entertainment franchise can force us to think about these issues does it great credit.